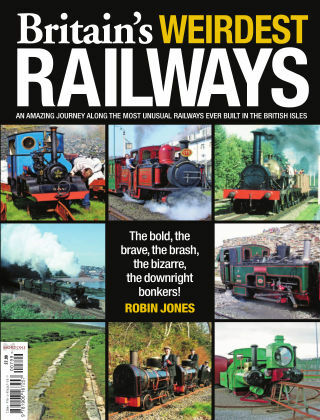 With Readly you can read Britain's Weirdest Railways and thousands of other magazines on your tablet and smartphone. Get access to all with just one subscription. New releases and back issues – all included. An amazing journey along the most unusual railways ever built in Britain. Heritage Railway editor Robin Jones has combed the British Isles to find the country’s weirdest railways, and presented the strangest of them in one volume. For years, conspiracy theorists talked about a secret railway network beneath Wiltshire to serve a bunker city which would have been the seat of government in the event of a nuclear war - and were proved right! The pictures are all in this book. Also, did you realise that there is a secret railway running through the fairy-tale island of St Michael’s Mount in Cornwall, or the remains of a complete network on Steep Holm in the Bristol Channel? Brunel’s Great Western Railway broad gauge was years ahead of its time - and so was his atmospheric railway - but both were edged out by market forces and deficiencies of available technology. Visit the Spurn Head Railway with its sail-powered vehicles. Look at the Volks Electric Railway in Brighton, the first electric line in Britain, and its truly bizarre sister line which had a passenger car running on stilts through the sea. Visit the farm lines in Lincolnshire used to carry potatoes to make Smith’s Crisps. See the unique railways carved from stone which was used to carry granite blocks to build London Bridge. Review Britain’s plans for hover trains - and British Railway’s patent for a flying saucer - a true story! All this and much, much more is to be found in Britain’s Weirdest Railways, a truly unique publication... not to be missed!